Roller coasters – The Physics behind the Fun Millions of people across the world ride roller coasters to get the thrill of their lives! 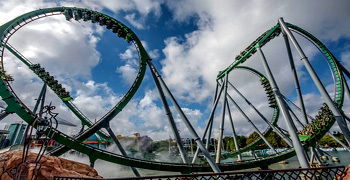 Find out what takes to make some of the fastest roller coasters work. What is a Roller coaster and what does it consists of? Mr. Samuel Bode Miller, an American World Cup alpine ski racer with the U.S. Ski Team who won gold medal in Olympics and a two–time overall World Cup champion in 2005 and 2008, says about the roller coaster, "You feel the Olympics and you get chills and nervous and a little scared. You go through the emotional roller coaster at what it&apos;s like to compete at the Olympic level and you let that run through your whole body". A roller coaster ride is a thrilling experience which involves physics of inertial, gravitational forces, vertical circular motion and also energy. 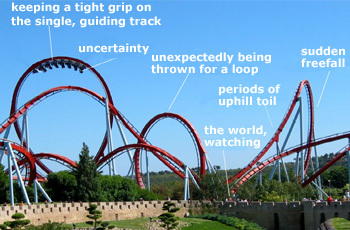 A roller coaster consists of a series of connected cars that move on tracks and look like a passenger train. But unlike a passenger train, a roller coaster has no engine or power source of its own. Roller Coaster at different positions A roller coaster is a machine that uses gravity and inertia to send a train of cars along a winding track. This combination of gravity and inertia, along with G-forces and centripetal acceleration give the body certain sensations as the coaster moves up, down, and around the track. A roller coaster is moved only by the forces of inertia and gravity, for most of its travel. The only exertion of energy occurs at the very beginning of the ride, when the coaster train is pulled up the first hill (called the lift hill) with a chain and motor (or other mechanical device) exerting a force on the train of cars. Once the cars are lifted to the top of the hill, gravity takes over and the remainder of the ride is an experience of the physics of energy transformation. The purpose of keeping the coaster train at the top of the hill is to build up a sort of reservoir of potential energy. Potential energy–the energy of vertical position–is dependent upon the mass of the object and the height of the object. As the coaster train gets higher in the air, there is a greater distance at which the gravity can pull it down. As the coaster train start cruising down that first hill, gravity takes over and this potential energy will be released as kinetic energy––the energy of motion that takes you down the hill. Falling track of a Roller Coaster Gravity is counteracted by the force of acceleration, which is the force that pushes you forward. Why dont roller coasters fall off their track when they go upside down? The tracks of the roller coaster control the way the fall of the train. If the track slope is downwards, then the gravity pulls the front of the train toward the ground, hence it accelerates. Similarly, if the track tilts upwards, then the gravity applies a downward force on the back of the coaster train, hence it decelerates. Due to inertia of motion (Newton's first law of motion) the coaster train will maintain a forward velocity even when it is moving up the track, opposite the force of gravity. When the coaster train ascends one of the smaller hills that follows the initial lift, its kinetic energy changes back to potential energy. Total energy is conserved in a roller coaster ride Although the potential energy and kinetic energy change quite a bit, their total, ideally stays constant (at 100%) starting at the top of the lift hill and while the train coasts around the roller coaster. In this ideal case, we say that the total energy is conserved. As the ride continues, the coaster train is continuously losing and gaining height. Each gain in height corresponds to the loss of speed as kinetic energy which would further get transformed into potential energy. Each loss in height corresponds to a gain of speed, as the potential energy gets transformed into kinetic energy. In this way, the course of the track is constantly converting energy from kinetic to potential and back again. By neglecting the influence of air resistance and friction, it can be said that the total mechanical energy of the coaster train is conserved during the ride. Energy is neither gained nor lost, only transformed from kinetic energy to potential energy and vice versa. The energy reservoir built up in the lift hill is gradually lost due to friction between the coaster train and the track, as well as between the coaster train and the air. The energy reservoir is almost completely empty at the end of the track. Inverted view A roller coaster inversion is an element of a roller coaster track that turns riders upside-down and then rights them. Is fictitious force fictional or real? As the passengers travel over the top of the loop, they would observe the world from an inverted perspective. The sky is below and the ground is above the passengers. 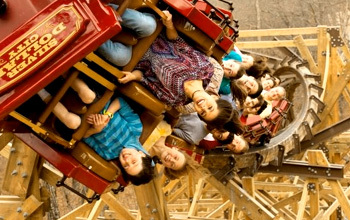 If a coin is dropped from the pocket it would fall towards the seat even if the roller coaster is upside down. This is because the roller coaster is accelerating forward more than the acceleration due to gravity hence even though gravity pulls it downward it moves upwards. As one observes that, the only forces around are the force of gravity and support forces from the car. The fictitious force is truly fictional; the passenger may experience a force towards the outside of the loop. What happens if the fictitious force in a roller coaster is less than the weight of the person? The person would likely to fall off the roller coaster if it goes slowly over a loop–the–loop, since the acceleration (downwards) of the roller coaster would not be sufficient to balance the weight of the person. 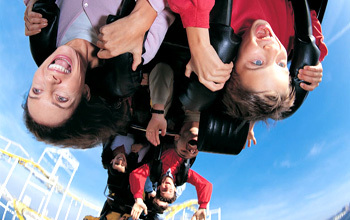 Some roller coasters would strap the people in the seat as a precaution so that even if the coaster goes upside down the chances of falling down would be minimal. People are strapped to ensure safety Many safety systems are implemented in roller coasters. Persons in roller coaster are strapped properly to overcome the risk with this huge machine. Applying Bullet train theory, is it possible to increase the speed of a roller coaster? Smoothening ring the tracks would only possibly avoid the jerks of the roller coaster and will make the ride less jerky. This Smoothening wouldn&apos;t reduce the acceleration needed to turn. The faster the train moves, the faster everything must accelerate as the track bends. 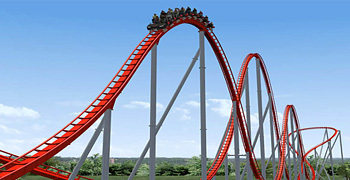 Doubling the speed of the roller coaster would double the changes in velocity associated with each bend and hence it would halve the time required for that velocity to change. Thus, doubling the roller coaster&apos;s speed would quadruple the accelerations it experiences on the same track and thus will quadruple the forces involved during the ride. A roller coaster ride already involves some pretty intense forces and accelerations. If those forces and accelerations were increased by a factor of 4, they would be more than most people could handle. Thus I wouldn&apos;t expect many riders on a double–speed bullet train roller coaster. Gravity–powered train With so little total energy left, the roller coaster can't have much gravitational potential energy and must be much lower than the top of the first hill. Why does a roller coaster end on a lower level than where it starts? A roller coaster is a gravity–powered train. Since it has no engine or other means of propulsion, it relies on energy stored in the force of gravity to make it move. This energy, known as "gravitational potential energy," exists because separating the roller coaster from the earth requires work––they have to be pulled apart to separate them. Since energy is a conserved quantity, meaning that it can&apos;t be created or destroyed, energy invested in the roller coaster by pulling it away from the earth doesn&apos;t disappear. It becomes stored energy: gravitational potential energy. The higher the roller coaster is above the earth&apos;s surface, the more gravitational potential energy it has. Since the top of the first hill is the highest point on the track, it&apos;s also the point at which the roller coaster&apos;s gravitational potential energy is greatest. 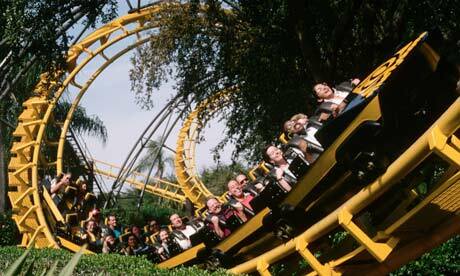 Moreover, as the roller coaster passes over the top of the first hill, its total energy is greatest. Most of that total energy is gravitational potential energy but a small amount is kinetic energy, the energy of motion. 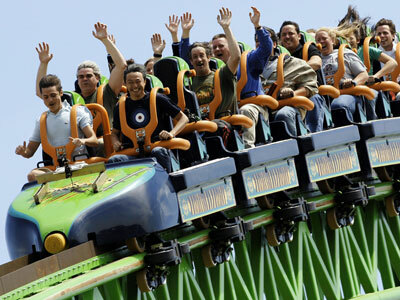 Lower and Higher tracks of Roller Coster Ride design with higher and lower tracks is crucial for increasing excitement. In the ride operations menu, making the ride time longer (by increasing the number of swings, turns, the time limit etc) increases the excitement rating. From that point on, the roller coaster does two things with its energy. First, it begins to transform that energy from one form to another––from gravitational potential energy to kinetic energy and from kinetic energy to gravitational potential energy, back and forth. Second, it begins to transfer some of its energy to its environment, mostly in the form of heat and sound. Each time the roller coaster goes downhill, its gravitational potential energy decreases and its kinetic energy increases. Each time the roller coaster goes uphill, its kinetic energy decreases and its gravitational potential energy increases. But each transfer of energy isn&apos;t complete because some of the energy is lost to heat and sound. Because of this lost energy, the roller coaster can&apos;t return to its original height after coasting down hill. That&apos;s why each successive hill must be lower than the previous hill. Eventually the roller coaster has lost so much of its original total energy that the ride must end. 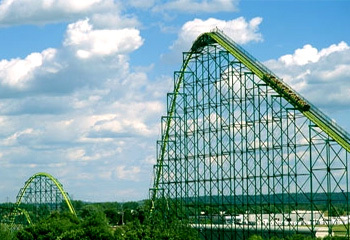 With so little total energy left, the roller coaster can&apos;t have much gravitational potential energy and must be much lower than the top of the first hill. End of the roller coaster ride When the train coasts to the end of the track, the energy reservoir is almost completely empty. At this point, the train either comes to a stop or is sent up the lift hill for another ride. It&apos;s then time for the riders to get off, new riders to board, and for a motor–driven chain to drag the roller coaster back to the top of the hill to start the process again. The chain does work on the roller coaster, investing energy into it so that it can carry its riders along the track at break–neck speed again. 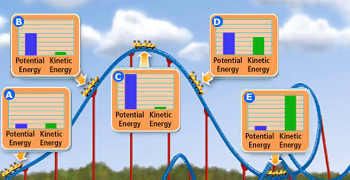 Overall, energy enters the roller coaster by way of the chain and leaves the roller coaster as heat and sound. In the interim, it goes back and forth between gravitational potential energy and kinetic energy as the roller coaster goes up and down the hills.